Note! Since the illustrations in this service information are used for different model years and/or models, some variation may occur. However, the essential information in the illustrations is always correct. Caution! Remove the ignition key. Remove the plastic pipes between the turbocharger (TC) and charge air cooler (CAC) and between the air cleaner (ACL) and turbocharger (TC). Put them to one side. Remove the clamp from the intake manifold for the turbocharger (TC) for cylinders 1, 2 and 3. Turn the upper section of the pipe towards the bulkhead. Relieve the load from the belt tensioner. Remove the auxiliaries belt. Remove the front timing belt cover. For cars with chassis numbers 203779-, see Timing cover front, replacing . Lift up the servo reservoir and place it on top of the engine. Note! 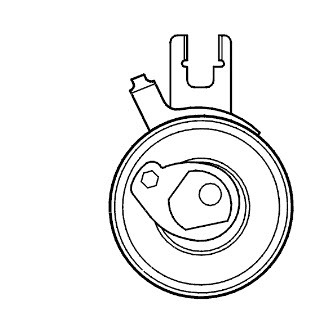 Ensure that the power steering oil does not leak from the breather hole in the filler cap. 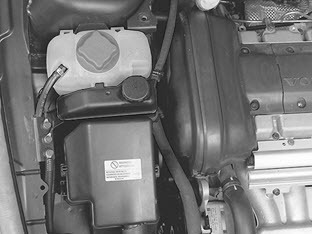 Seal the hose between the expansion tank and the radiator. Disconnect the hose at the tank. Lift up the expansion tank and place it on top of engine. the plastic nuts on the cover in the wing liner. Install the upper timing belt cover. Turn the crankshaft clockwise until the markings on the crankshaft and camshaft pulleys correspond. Turn the crankshaft a further 1/4 turn clockwise. Then turn back counter-clockwise until the markings correspond. Remove the 4 vibration damper screws. Counterhold the crankshaft central nut. the belt cover behind the crankshaft pulley for the auxiliaries belt. Spray universal oil or similar around the rubber sleeve on the underside of the oil pump. Slacken off the centre screw for the belt tensioner slightly. Hold the centre screw still. Turn the tensioner eccentric counter-clockwise using a 6 mm Allen key. Turn to 10 o'clock. Unhook and remove the timing belt. Note! The component can be reused unless it has been subjected to abnormal mechanical stress, damage or oil contamination. Caution! The crankshaft or camshafts must not be rotated while the timing belt is removed. Spin the idler pulley and listen for noise. If replacing with a new idler pulley, tighten to 24 Nm. Spin the tension pulley and listen for noise. When replacing, screw the tension pulley into place using the centre screw. Screw in the centre screw by hand. 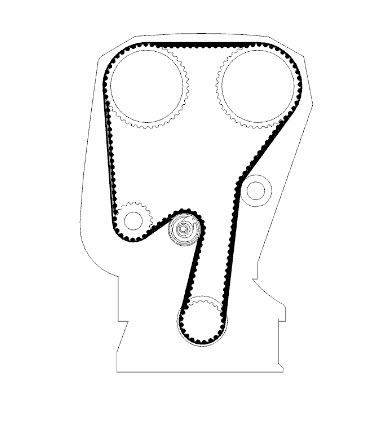 Ensure that the tensioner fork is centred over the cylinder block rib / bracket. Ensure that the Allen hole on the eccentric is at "10 o'clock". Note! The variable valve timing unit on B6304S does not have a return spring. The unit is easily dislodged when reinstalling the timing belt. This adjustment is done with a cold engine. 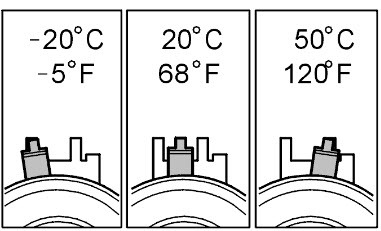 Suitable temperature is approximately 20 ° C/ 68 ° F.
At a higher temperature, for example with a warm engine or a higher ambient temperature, the needle is farther to the right. 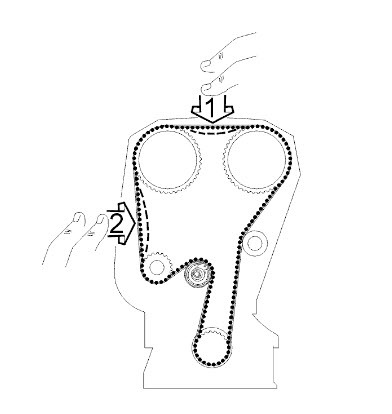 The illustration shows the position of the indicator when aligning the timing belt tensioner at different temperatures. 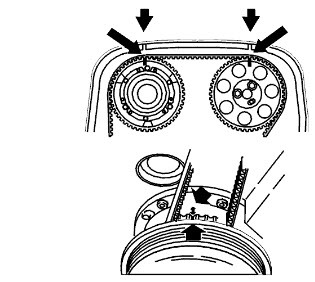 Carefully turn the crankshaft clockwise until the timing belt is tensioned. 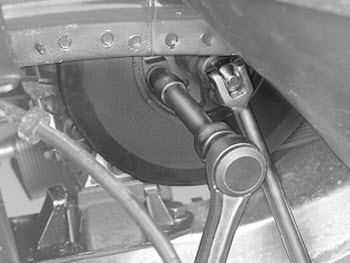 The belt must be in tension between the intake camshaft pulley, the idler pulley and the crankshaft. Hold the belt tensioner centre screw secure. Turn the belt tensioner eccentric clockwise until the tensioner indicator passes the marked position. Then turn the eccentric back so that the indicator reaches the marked position in the centre of the window. Hold the eccentric secure. Tighten the centre screw to 25 Nm. 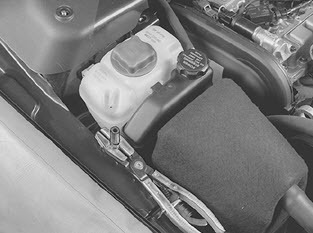 Press the belt to check that the indicator on the tensioner moves easily. Turn the crankshaft 2 turns. Check that the markings on the crankshaft and camshaft pulley correspond. 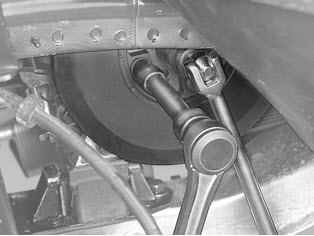 Install the auxiliaries belt around the pulley on the crankshaft. the right front wheel. See Installing wheels . For cars with chassis numbers 203779-, see Timing cover front, replacing:Installing the front timing cover . Twist the intake pipe for the turbocharger for cylinders 1, 2 and 3 into position. Tighten the clamp. 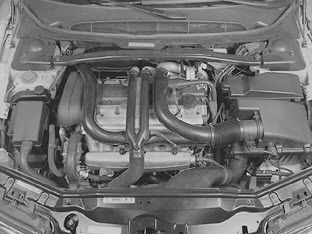 Install the plastic hoses between the turbocharger (TC) and the charge air cooler and between the air cleaner (ACL) and the turbocharger (TC). the screw holding the engine stabiliser brace to the bracket on the engine. Tighten to 80 Nm.